And this is the perfect summer tart to celebrate...... Cheerful, vibrant, full of the rich, sweet, colourful flavours of the Mediterranean..... This tart sings of sun, sea, and perfectly sultry, cicada-accompanied evenings. 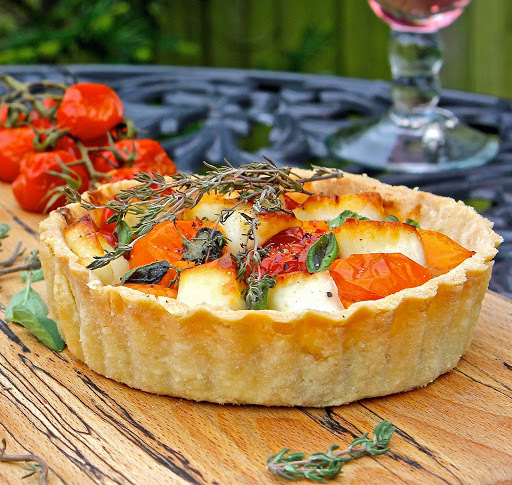 When Sainsbury's asked me to join their latest 'Get Summer Started' celebrations (as part of their Live Well For Less Campaign) and to think of great food ideas to help get the party going, this tart was my spontaneous response...... I mean...... look at it...... Is there anything that you see that doesn't shout 'Summer' from the rooftops? Made with my favourite and most reliable almond pastry, the case is short, crisp, light and full of the wonderful nutritional properties that almonds offer. As is the way with most gluten free pastry, it doesn't always roll perfectly-enough to get into the tin without an occasional crack or snag, but it is amazingly forgiving in that it 'patches' and seals like new and never gives you a soggy bottom! The pastry case is layered with good stuff..... starting with a little mild Italian Mozzerella, a handful of deep green iron-filled baby spinach leaves and some fried red onions and garlic. Next comes the most incredibly beautiful layer of balsamic-roasted cherry tomatoes and roasted sweet baby peppers. I am in love with roasted vegetables and fruit right now.... The roasting process reduces the liquid content releasing the most amazingly intense flavours you can imagine...... taking the humble tomato, pepper (or anything else you choose) to a new and sensorily exquisite level. A good drizzle of high quality Balsamic (Sainsbury's have a fantastic range, but it really is worth getting the best you can afford..... I always use a Modena balsamic vinegar, preferably aged), adds an extra depth and slightly sticky richness which enhances the explosion of flavours even further. Each mouthful has a careful balance of textures....... The crunch of pastry..... The slight 'squeak' that comes only from Halloumi.... The softness of roasted vegetables. 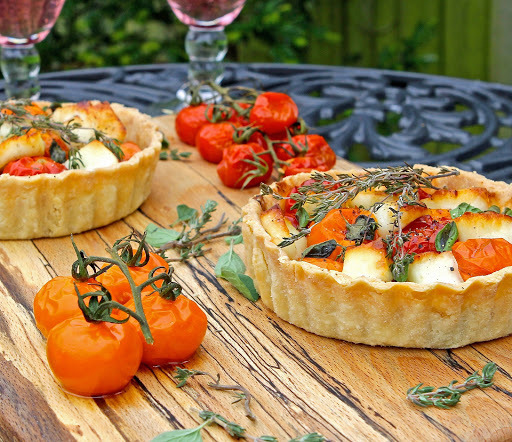 The tomatoes (which have been roasted whole) release their juicy interior with every bite, exciting the taste buds with a liquid burst full of fresh summer garden sweetness. This tart can be made as one large pie (perfect for a family get together) or as individual, or even mini tarts, which look as pretty as they are tempting on any summer garden party table. So what are you waiting for? 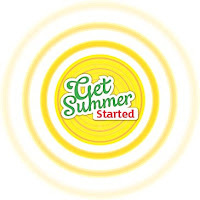 This is exactly what you need to get summer started! 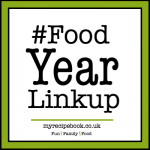 Food Year Linkup with Charlotte's Lively Kitchen. This month celebrates a nationwide Free From Feast with Allergy UK as well as a very summery National Picnic Week. This tart would be perfect for both! Weigh and sieve the flours, xanthan gum and salt into a large bowl and stir together with the ground almonds. Bring the dough together with your hands and press into a ball. Knead very briefly to ensure the ingredients are fully amalgamated. 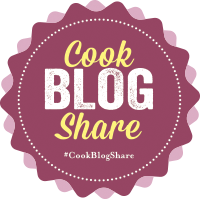 Roll out the pastry straight away (do not chill in the fridge), using a liberal sprinkling of corn flour on the work surface and rolling pin to prevent any sticking. If you are making one large tart, roll all the pastry in one go. If you are making smaller tarts, cut pieces of pastry dough to roll one tin at a time. Carefully lay the rolled pastry over the tin(s) with the support of the rolling pin. Ease into the base(s), gently moulding into the sides of the tin(s). Trim the pastry edge flush with the top of the tin(s), using a sharp knife. If there are any cracks or holes in the rolled pastry base, use the trimmed remains to 'repair'. - Roll and cut to size, and using cold water, dampen both the area around the crack/hole and the down-side of the 'patch' and gently press together, smoothing the edges with a finger dipped in water to seal and tidy. Place the prepared flan pastry in the fridge for half an hour to chill prior to baking. Scrunch and then flatten a piece of baking paper large enough to lay inside the flan base and base-fill the pastry case with baking beans. When the oven has reached temperature, blind-bake the pastry with the baking beans for 10 minutes. Remove the beans and bake for a further 5 to 8 minutes, being careful not to let the pastry brown too much. When the pastry cases are cooked remove from the oven and set aside to cool until ready to use. Pre-heat the oven to 200 C/400 F/Gas 6 and brush the base of a roasting tin with olive oil. 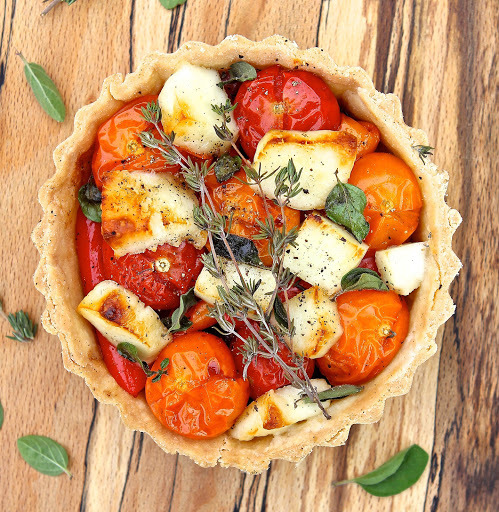 Arrange the whole cherry tomatoes and cut peppers in the roasting tin and drizzle with olive oil and balsamic vinegar. Roast for 30 to 40 minutes until the peppers are beginning to brown nicely at the edges, then remove from the oven and set aside in the dish to cool completely. In a small saucepan, gently fry the onion and then the garlic (separately) in a little olive oil until soft and beginning to caramelise. Set aside until ready to put the tart together. 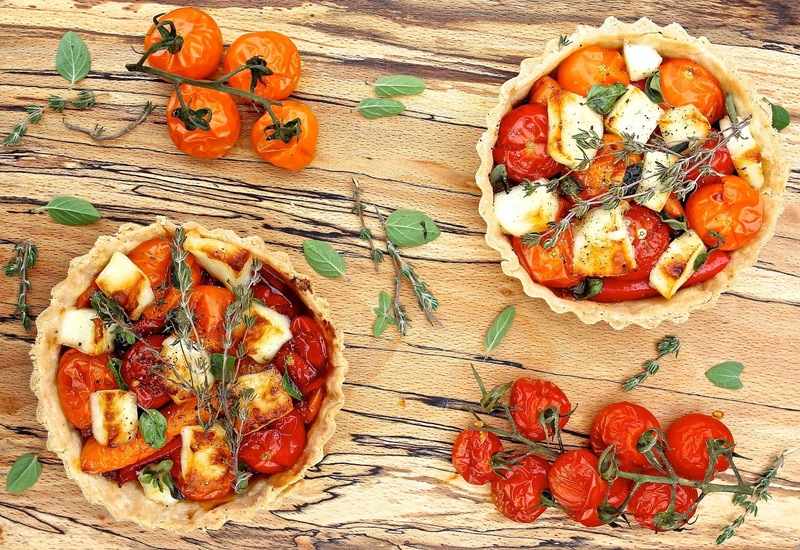 To put the tart together : take the baked tart cases and sprinkle a fine layer of Mozzarella in the bottom. Place a layer of spinach on top of the cheese, followed by a scattering of the onions and garlic. 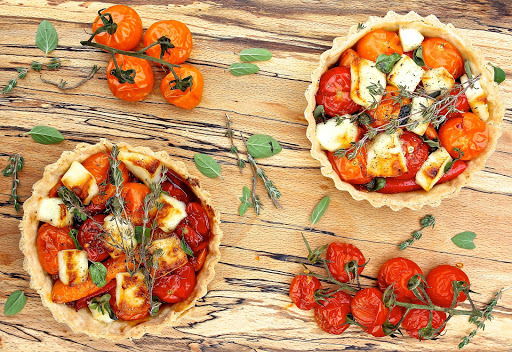 Next, arrange the roasted tomatoes and peppers in a layer and top these with a scattering of Halloumi cheese cubes. Finally, put a handful of drops of balsamic vinegar across the top, scatter with fresh herbs and add a good grind of black pepper. Place the tart(s) back in the oven at 190 C/375 F/Gas 5 and bake for 20 to 30 minutes until the edges of the Halloumi cheese tinge brown. Remove and enjoy in the garden with cold glass of summery sparkling wine. 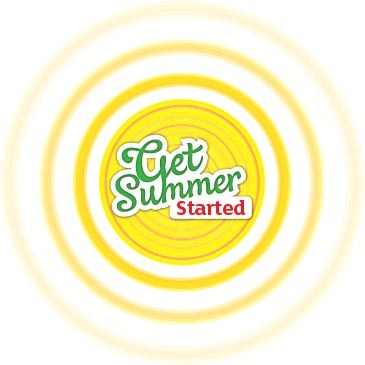 This post supports Sainsbury's Get Summer Started campaign, but was not a paid post. Sainsbury's covered the cost of ingredients, but the recipe and content of the post are my own. These look incredible!!! The pastry looks amazing too. I love tarts but my kids both hate pastry (and I currently can't have it)...I have no idea why! How can anybody hate pastry? Thank you Vicki. What is not to love about pastry???? Kids eh?! Oh yes, this tart shouts summer and I so want to bite into one right now. 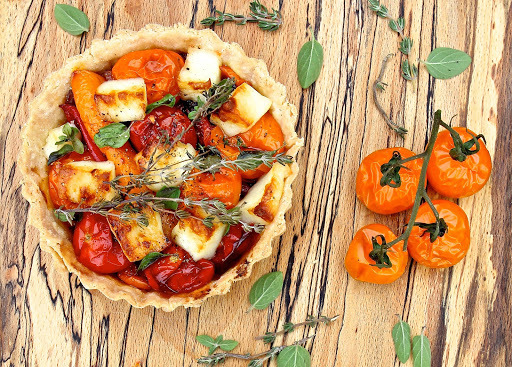 Your pastry looks crisp and elegant, the veg super colourful and I adore halloumi. All that's needed now is the weather to got with it. Thank you Choclette. Sounds like it is just your sort of tart then?! I am very proud of my GF almond pastry. I have yet to test it on anyone who did not like it and it is always beautifully crisp! Oh Kate Yu have excelled yourself here. 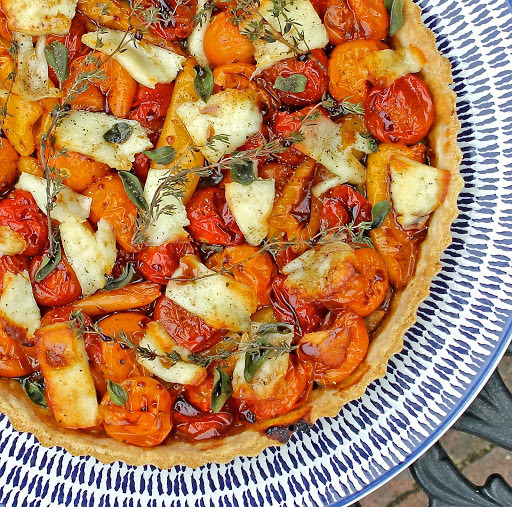 That's a beautiful beautiful tart. I love everything about it. I have to make that pastry. 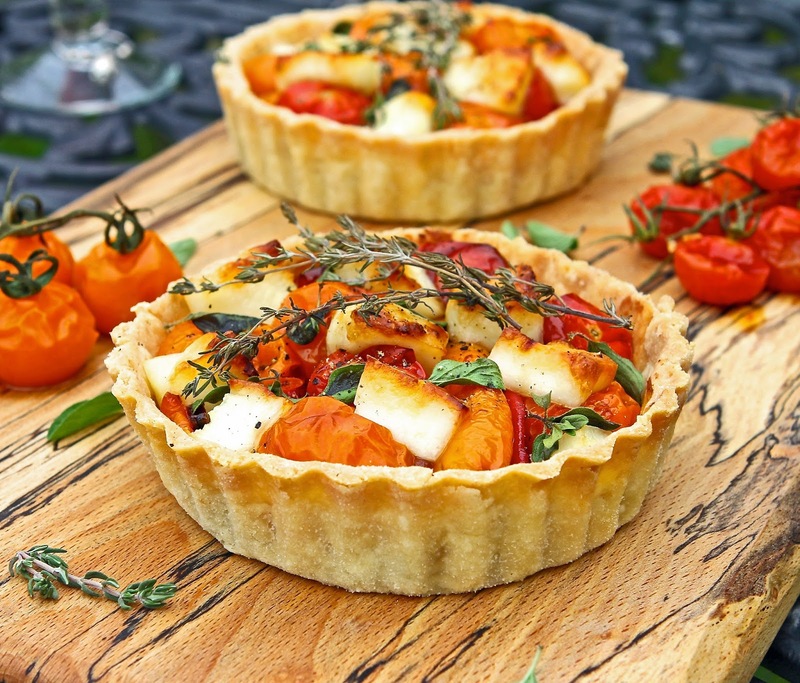 It looks stunning and I love the tart packed with fresh veg and mozzarella! Well thank you Dom..... I always strive to improve!!! I've now made (and eaten) the tart twice...... I can confirm it was as good the second time as it was the first! Aaawww Thank you Alison. I'm not sure any food should be too pretty to eat! Especially when it's this tasty! Thank you Sarah. Roasted tomatoes (or any thing else roasted for that matter) are so, so good! I even roasted pineapple the other day... Yum! I could have this right now, healthy and nutritious. A perfect lunch idea. Bravissima! Oh my Kate! These really do shout out summer. They look fantastic and such wonderful colours too! Really want one for lunch now!